The house on the far right was our ‘Winter Harbour’ home, we also owned the large tin shed (with rust on the front) to the left of the house. Growing up on the northwest coast of Vancouver Island in and near the mouth of Quatsino Sound, whether it be Quatsino, Winter Harbour or somewhere else within the inlet, was very similar. The whole area, had no television, no phones, no roads with access to civilization and no power, with the exception of Port Alice and Coal Harbour, which were only accessible by boat, or seaplane. They both had roads across the island to Port Hardy and they also had telephone and power, just no television. I grew up in Winter Harbour where we moved to in 1956, from Drake (Limestone) Island, and my memory of the homestead on the island is very limited as I was just under six years old when we moved. Our house in Winter Harbour was built right at the high tide level and extreme tides would sometimes flow into our basement, as was common for other houses there also. Winter Harbour (‘the harbour’) was built as a fishing village in the early to mid 1930’s and it did have a store, post office and school as did Quatsino. The ‘harbour’ was settled for one reason, and that was to be close to the fishing grounds, as those that built the small place were commercial fishermen. What the harbour didn’t have (and in my opinion – was better off without) was television and a road out of there connecting with the outside world. We also had no power, or telephone, which would have been an asset, but we could live without, as many of the people living there had never experienced these things. Everyone in the harbour had vegetable gardens to cut the cost of living, as the little store was quite expensive. Although, the store keeper Louis Sharbo, was a very smart man, and he stocked everything that a place like the harbour would need. At his store you could buy food, clothing, hardware, building materials, sport and commercial fishing gear, guns and bullets, almost everything you would ever need, or want. We grew up with all the necessary things, and we were never inside watching TV. We were outside beachcombing, playing, hunting, fishing and just about everything else. We learned to do things on our own, without help from others, whether it be a mechanic, doctor, plumber, electrician or any other specialist. The nearest doctor was thirty miles away, and the only way to get there was a four hour boat ride, or by seaplane if the weather was good. My mother had a doctor book and she treated us. She kept us all alive and healthy, and she helped many others too. My mother was the hardest working woman I have ever known, and I mean her physical strength was unbelievable. When we thought we were strong, she would show us what strength really was. She never had an easy life, and in all honesty, I really don’t think she wanted one. As a kid, if I wasn’t in school, I would be out rowing around in a rowboat, walking the beach just outside the harbour, fishing off our wharf or playing with one of the other kids there. There was always plenty to do, and we did it. The oldtimers that lived there would always stop and talk when you met up with them somewhere in the harbour, and would tell you things that they learned the hard way, so you wouldn’t have to repeat what they had to do. They were very knowledgeable. Some of them had never gone to school, but with the practical knowledge they had they should have been teaching, as the ABC’s don’t mean anything, if you can’t apply them to life itself. Being a genius at rocket science doesn’t do you any good when you are fifty miles from other people and suddenly your car breaks down on a deserted road. You must be prepared to face life, and do not count on others to be there to help you out of every difficult situation. For lights at night we had kerosene (coal oil) lamps and gas lanterns, but we also had a generator for electric lights, as did everyone else. At night the harbour would be humming away with the sounds of maybe ten lighting plants running. A few were diesel engines, but most were gasoline and not very dependable, very often broken down. No one that lived there (except the store) had a freezer, or refrigerator, so food that would spoil was usually canned, or put into jars to keep it from going bad. Most of the families lived on fish (salmon and cod), deer, (during hunting season) and what they grew in their garden, as meat like beef and pork were eaten rarely because they cost a lot of money. There were no cows or horses in the area, or a means of fresh milk. The store would get in fresh milk and freeze it, so if you got there on freight day you might be lucky enough to get some that wasn’t frozen. The freight and mail was shipped from Vancouver once a week and came by tug and barge. A tug towed the large covered barge which had freezers and coolers onboard and that supplied the villages of Port Hardy, Winter Harbour, Quatsino, Holberg, Coal Harbour and Port Alice with food and mail. Once the freight was all unloaded at the different places, the barge would load with pulp at the Port Alice pulp mill and return to Vancouver. Our barge (freight) day was Thursday, (weather permitting) and it was not uncommon to see most of the residents of the harbour down at the government dock, where the barge docked, helping with the freight and talking to the tug crew. If the freight and mail came in at night, no matter what time, any frozen goods had to be moved to either the store freezer, or the logging camp freezer two miles up the inlet. There was no road between the fishing village part of the harbour and the logging camp part, so everything was moved by boat. Winter Harbour fishing village in the winter months (from mid September till mid May) would have a very small population, approximately 25 people total, and even less at times. In mid May the fishing fleet from all over the coast and mainland (Vancouver and Victoria cities) would start arriving and when the salmon fishing was good, it was not uncommon to have one hundred and fifty to two hundred outsider boats in the harbour after the fishing day, and people would be everywhere. There was no hotel, cafe’, or places for the outside fishermen to enjoy on land other than a large one room community hall, which was always open for anyone, or they would visit with the locals, but mainly they stayed on the docks, quite often in groups telling fishing tales (you know that BIG one that got away) and sometimes getting drunk. When I was sixteen, I went to work at the logging camp two miles up the inlet in Winter Harbour, and worked there for the next twenty-seven years during the winter months. I took a leave of absence to commercial fish for salmon and sometimes other species during summer months. Today that little place called Winter Harbour is not the great place it once was, as there is no longer a viable commercial ‘trolling for salmon’ season, and the community has changed to sports fishing. 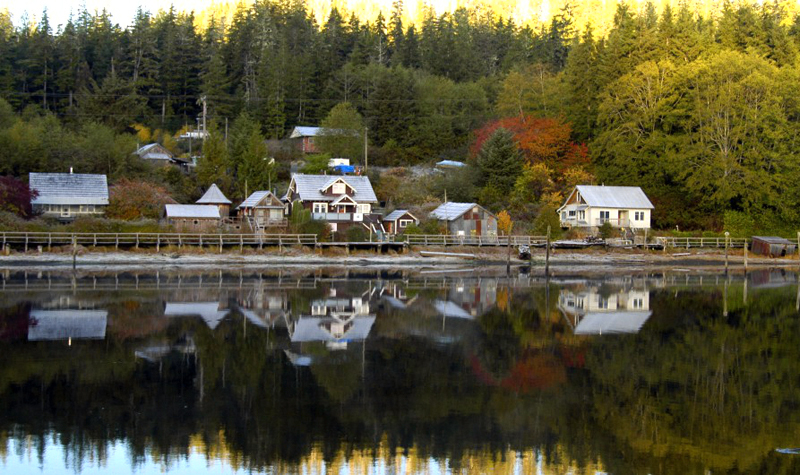 Almost every house there is now a fishing lodge, and it is a totally different breed of people living there. Winter Harbour is not alone, Quatsino is going the same way, but as it is farther from the fishing grounds, and still does not have a road connecting it with other parts of the island, the change is happening somewhat slower. Anyway, growing up in the isolation of that area was about as good as life can be. Everyone I know of that left the harbour because of old age, or for medical reasons, couldn’t forget the great life they enjoyed there, and if given the chance they would return there in a heartbeat – return to the old Winter Harbour of twenty-five years ago, not to the one of today. It was a terrific life, that no longer exists, and believe me, that TV set, and telephone I now have is used very little. I do not own a tablet or cell phone, and I never will. I grew up without what most people in populated areas consider a necessity, and learned to do things myself, without the need of specialists to help, or show me how. When I was just a teenager I was repairing outboard engines for people in the harbour. All my five brothers and father were like this also, and my mother was so independent that there was a lot of people that didn’t know how she managed to do all that she did, and that also includes myself. She loved Winter Harbour, and after a stroke, two years before she died, all she could think about was going home to the harbour. We did take her back there for short visits but she could not survive there because of the lack of a medical facility. Elizabeth Louise Paulsen (Barnett) was a true pioneer that didn’t walk away from trouble, but ran towards it and took care of the situation. She taught her family to do likewise, but none of us could handle a situation anywhere near as good as our teacher, our mother. She was extremely well liked and respected by everyone, and so well known for her kindness towards others. If there was something she could do to help someone, she was there, and there was no limit to what she would do for them. I left the harbour in 1994 after the logging camp downsized and the part where I worked (on the water) was taken over by Western Forest Products, the company in which my boss contracted for. My two surviving brothers and I sold our Winter Harbour home in the year 2000, as without our second oldest brother, who lived there until he died in 1998, we no longer had any need, or use for it. The gravel road was connected to the outside world in approximately 1974/75, television with two channels (by antenna) was about 1977, and power was in 1990-1991. Telephones were brought in about 1988. (dates are approximate but very close) It was a great life that is now just a grand memory…………..
As I meet the younger generation of today, I can only wonder, where we are headed, as without their texting, which is almost constant, they are lost. About life itself, they understand nothing, and if the internet goes out, they wander around in a very thick fog, moaning. Albert Einstein once said, “when technology exceeds the human brain, we are going to have nothing but idiots”, I would hate to think that day has arrived, but I do sometimes wonder.